Falling in love is wonderful, but it also comes with plenty for both men and women with all sorts of personality traits and personal weaknesses they'd like to secret to fear. Most of the time, when you read about relationships or see portrayals of being in love on TV or in the movies, the story focuses on the best, most easy-breezy aspects of being in love. Seldom do they spend much time talking about all of the ways that falling in love makes you feel weak, frightened, and worried about the future. But those feelings do exist, and in fact, they often exist right there alongside all those warm and fuzzy feelings taking center stage, and personally, I believe it's time we talk about those creaky bits far more. In order to fall in true love and to be loved truly in return, you have to make yourself vulnerable. Being vulnerable, however, is another way of saying you expose yourself deepest weaknesses, which explains why allowing that to happen feels so darn scary! No one wants to be perceived as weak, because we tend to believe that if we are, it means we are also being seen as someone who is easy to control or manipulate. It's tough to realize that this is the way we think, but we do, and it informs a lot when it comes to how we relate to other people in our romantic relationships and beyond. If you want to know what your own hidden fear is when it comes to showing your weaknesses in love, you've come to the right place. This personality test is designed to help you get accurate answers to this question as quickly as possible. 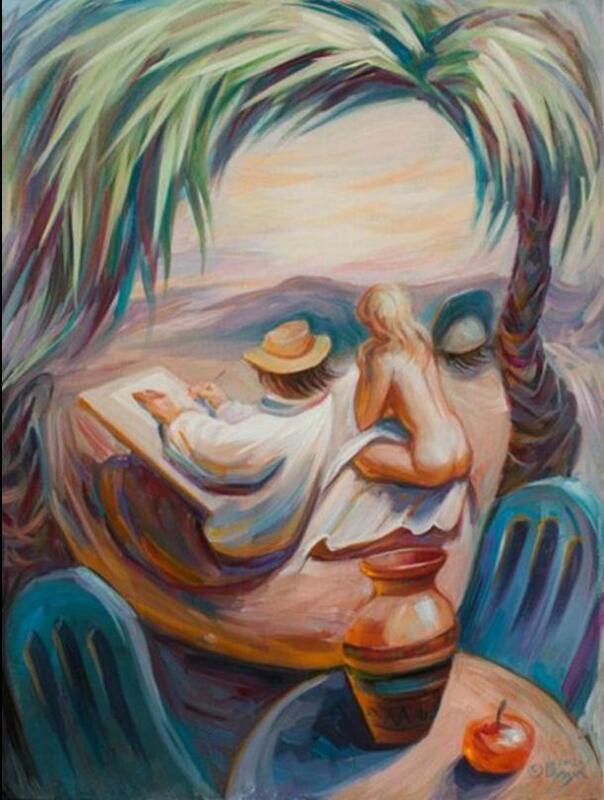 Simply look at the picture below and make a mental note of the image you see first. Next, scroll down to find out what this personality test reveals about what you secretly fear most about showing your weaknesses in love. If you saw the artist first when you looked at this image, your secret fear about showing your weaknesses in love is your concern that it could be used against you by your partner. You are a person who is exceptionally set in your ways. You know that relationships founded on love are about compromise, and you aren't scared of that ... exactly. You're open to compromise if it's with someone genuine and kind, but you're terrified that your love for your partner will become a weapon that they use against you. Try to lower your fists. You can't get truly close to someone without taking a risk by letting down your guard. If you saw the woman sitting backward first when you looked at this image, your secret fear about showing your weaknesses in love is that they will reject you if your looks fade. Although you know in your heart that you are a person of worth who deserves love regardless, you also rely on your physical appearance to drive your confidence. What if the person you love leaves you when and if your looks change? If a person who is meant to love you is going to make the choice to leave you just because your exterior changes, they are doing you a favor by leaving. You deserve to be with someone who loves you no matter what. Trust that. If you saw the apple first when you looked at this image, your secret fear about showing your weaknesses in love is that it will consume all of your time mentally and socially. You have always been a person who thrives provided that you get plenty of time to yourself, and you worry that if your partner knows just how much you love them, they will begin to take up more and more of the alone time you so dearly require. Much like several others areas in life, relationships are a balancing act. If time to yourself is something you need, don't be afraid to say that. A loving and understanding partner will easily understand. If you saw the face with the closed eyes first when you looked at this image, your secret fear about showing your weaknesses in love is that your heart will be broken forever. You love the idea of falling in love and when you fall, you fall with utter abandon. That said, you are often afraid to let yourself do that, because what if your heart gets broken in the process? That's the risk we all must take if we ever want to find really and lasting love. A broken heart is a gut-wrenching experience, but far worse one is cutting yourself off from the possibility of ever finding true love.